Dortmund Airport - A relaxing start to your journey. we make everything quick and easy. Return flight Please select a valid destination. Departure date Please select a valid date for the outbound flight. Arrival date Please select a valid date for the return flight. It's easy and takes just a few clicks: Book your parking space at Dortmund Airport in 4 easy steps. This guarantees you a parking space in the booked car park or parking area. Do you have questions about your online reservation? You can find answers on the Dortmund Airport parking webpage. Take off not far from the city and land at destinations throughout Europe. Dortmund Airport is on the eastern edge of the Ruhr district and can be reached quickly and easily by car or public transport from any direction. Travel relaxed by finding out about the applicable regulations and statutory provisions before you fly. In this way, you can avoid unpleasant delays and enjoy a pleasurable flight. Travel to all over Europe from Dortmund. at inexpensive prices here in a few clicks. 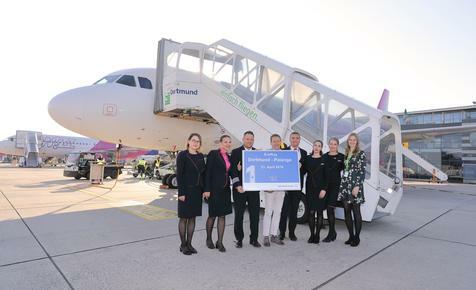 Experience the exciting world of aviation, either at home on your PC or live at Dortmund Airport.